The Caribbean abounds in cruises. We get on ships and sail over blue waters, the skies flecked with fluffy white clouds, picturesque islands in the distance. When we go ashore, there are big tropical plants with intensely colored flowers to marvel at. But much of the Caribbean is very dry. Some smaller islands have no permanent water and some hillsides on other islands are virtual deserts. Every subject I write about has far more information available than will reasonably fit into even two posts. (previous primrose posts 1, 2). Usually I keep it to two posts and save the rest for "someday." However, I can't resist sharing what I learned about the word thrum and the color primrose. First: what is a thrum? The only place I'd ever heard the word thrum was in a graduate school botany class , for the flower form of primroses (link)--until I started weaving ten years ago. Thrums are the short ends that are cut off when a piece of weaving comes off the loom. From Dictionary.com: 1. one of the ends of the warp in a loom, left unwoven and remaining attached to the loom when the web is cut off." Primroses, genus Primula, are well-known European spring garden flowers. And wildflowers, since the common English name cowslips is probably from cowslops, --the common primrose, Primula veris, grew (and grows) well in English cow pastures. The English liked them as a sign of spring. (Link to previous post). Which is probably why Charles Darwin and botanists before and after him, took a close look at the flower and discovered that there were two kinds of flower. 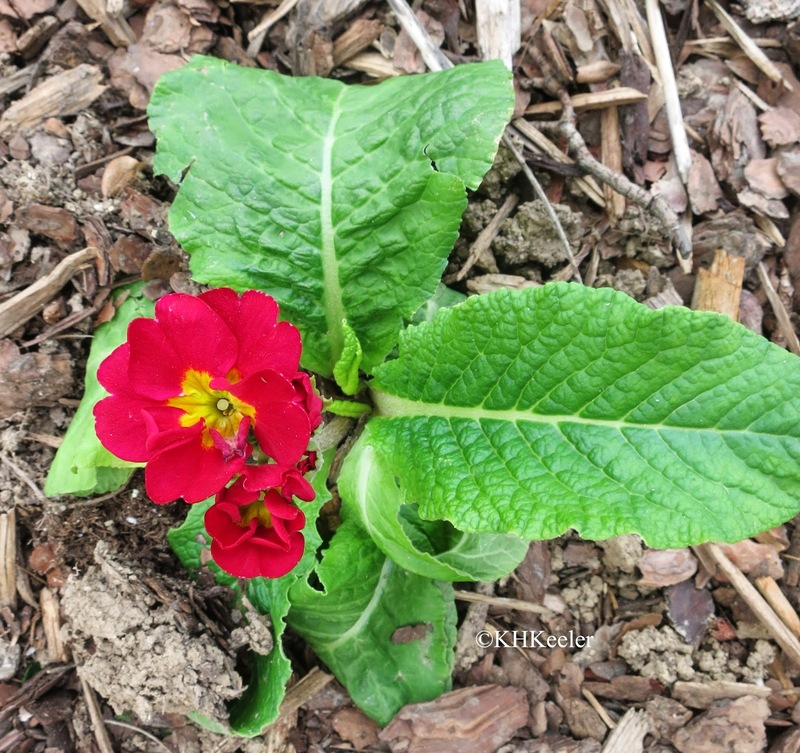 Not two species, but two different flowers within a primrose species. I’ve been trying for years to grow primroses, genus Primula. Last year I stuck three sad little plants, rescued from the nursery’s end-of-the-season stock, into my yard and ooh, this spring all three are alive and flowering! What is special about primroses? Also, I associate them with the literature set in England I read as a child. Primroses grew in the well-tended gardens of the ladies in quaint English villages. In addition, primroses were the usual example of a curious plant reproductive system, studied by Charles Darwin himself and carefully described to us by my professor at Berkeley, Herbert Baker, an Englishman with a fondness for them.